Now that the Level 2 Protocol issues have been resolved (and equipment is running~ see below) it's time to focus our attention on the next protocol level and come to some kind of group consensus about which way we want to go. I will present some general outlines of the issues and hope to have some feedback from the group. Implementation of a Level 3 protocol here would be a giant step forward for packet radio. Final planning for the National Packet Conference at the Faire will also take place. The code in the KA6M/R repeater has been revised to accept the new national standards, and it is now back on the air. 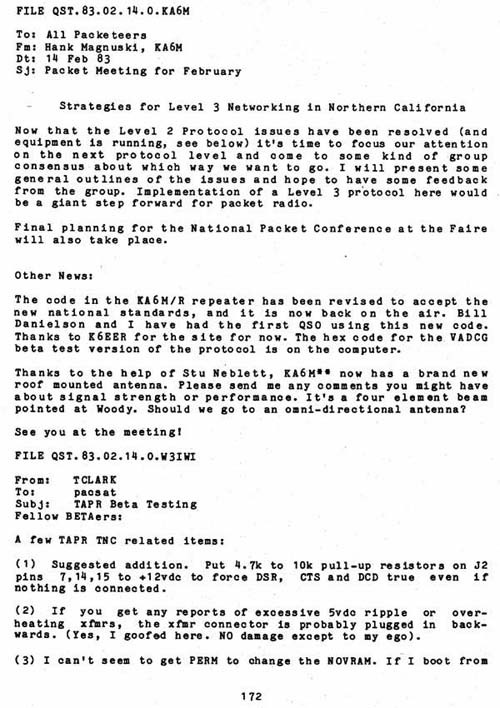 Bill Danielson and I have had the first QSO using this new code. Thanks to K6EER for the site for now. The hex code for the VADCG beta test version of the protocol is on the computer. Thanks to the help of Stu Neblett, KA6M** now has a brand new roof mounted antenna. Please send me any comments you might have about signal strength or performance. It's a four element beam pointed at Woody. Should we go to an omni-directional antenna? See	you at the meeting! (1) Suggested addition. Put 4.7k to 10k pull-up resistors on J2 pins 7,14,15 to +12vdc to force DSR, CTS and DCD true even if nothing is connected. (2) If you get any reports of excessive 5vdc ripple or overheating xfmrs, the xfmr connector is probably plugged in backwards. (Yes, I goofed here. NO damage except to my ego).